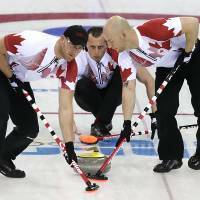 SOCHI, RUSSIA - Canada opened its bid to defend the Olympic curling title by scraping past Germany 11-8 on Monday in what should have been the biggest mismatch of the men’s tournament. 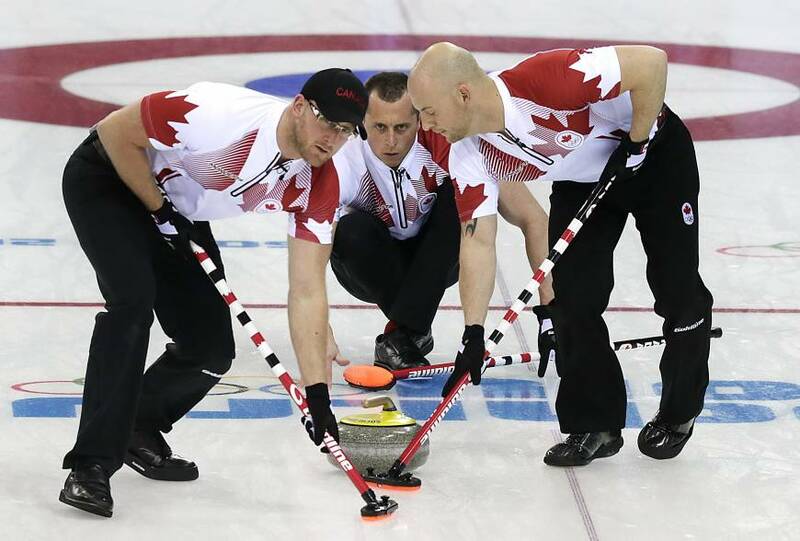 “It was pretty ugly, to be honest,” said Brad Jacobs, who is skip of the team that is seeking Canada’s third consecutive men’s Olympic gold medal. Medal contenders Britain, Sweden and China also won in the opening session at the Ice Cube Curling Center. Jacobs said he knew very little about the German team coming into the Sochi Games. He knows a lot more now. Germany, which only reached the Olympics via the qualification tournament on home ice in December, stole two points in the third end to go ahead 4-2 before Canada rallied to regain the lead. In the ninth end, Germany closed the gap to 9-8. Throwing the final rock, Jacobs missed draws in both those ends — big mistakes for a skip who was brilliant for Canada in a breakthrough 2013 and is widely viewed as the top player in curling. Jacobs said he found it tough playing through the din of the horn-blowing Russian fans, who created a lively atmosphere despite the arena being only three-quarters full. The home supporters fell quiet in the second half of their team’s first game, though, as Britain scored four points in the sixth end to go 6-1 ahead before easing to a 7-4 win. The British team — made up of Scottish players — were watched by Princess Anne, the daughter of Queen Elizabeth II and a past Olympic competitor in equestrian. Bagpipers led the teams out onto the ice before play, giving the event even more of a Scottish feel. China defeated Denmark 7-4, while world champion Sweden beat European champion Switzerland 7-5 in the tightest game of the opening session. Switzerland’s cowbell-clanging fans saw their team lead 3-2 after six ends but Sweden got three points in seventh and held on. There were four games scheduled for the evening session, too, when Norway plays the United States. Expect soccer socks, flat caps and knee-length pants from the Norwegians, whose funky fashion sense has only intensified since they caused a stir at the Vancouver Olympics with their bold, diamond-printed pants.